Mike Ashley set to sack off Sports Direct & take over at Debenhams? Here’s what to expect.. – NUFC blog – Newcastle United blog – NUFC Fixtures, News and Forum. 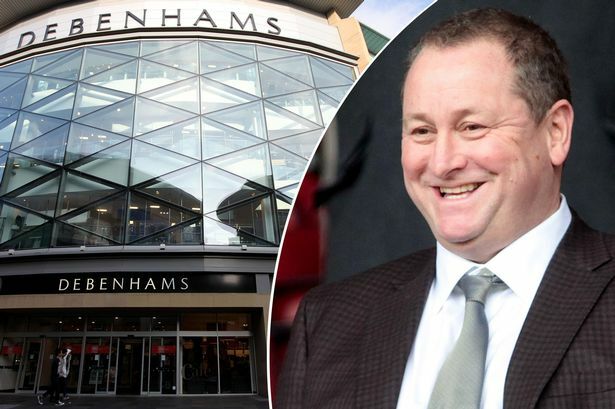 Mike Ashley set to sack off Sports Direct & take over at Debenhams? Here’s what to expect..
Once again the Guardian Angel of struggling indebted companies is to swoop in and save a treasured national asset steeped in history and tradition. This comes after news today that Mike Ashley is planning to ‘step down’ at Sports Direct at focus his attention on the running of Debenhams instead. As a Newcastle United supporter we know just how beneficial having Saint Mike at the helm is. So here is what Debenhams should expect from the patron saint of struggling businesses. Debt – Saint Mike will swoop in and ensure that all debts are paid off and will never throw it back in your face what he has done for you every time you make a request. Manager – As Debenhams manager you will be paid handsomely. This should give you no excuses as to why you cannot perform your duties. Even if he will not hire the staff you need or put any funding in place to train youngsters. You will however be allowed to loan staff but never offer them a permanent position. Oh and you will get a new pen…as long as it is supplied by sports direct. Uniform – All uniform will be supplied by Sports Direct so look forward to Lonsdale tracksuits and puma trainers. Branding – To help strengthen the position of Debenhams expect strong support of Sports Direct. They will be so keen to help expect the logo to be plastered everywhere. Sales – Saint Mike is such a keen salesman he will help improve sales for you. In fact if he receives an offer good enough expect him to sell such items as cash registers, carpets and even the front doors. Don’t worry thought he will bring in some inferior replacements on loan. Purchasing – Don’t ask him to purchase anything. Once you have had the spirit completely beaten out of you come along to St James’ park…you are among friends. Sports Direct Banners and ads down, Debenhams up for next season…. Oh! the life of a billboard club…………..